If you’re someone who dreads the spring cleaning season then fear no more. 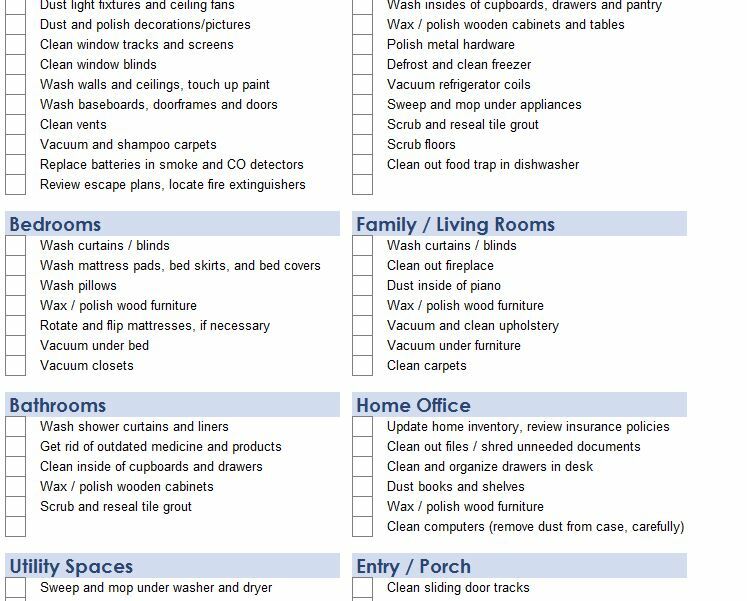 The Comprehensive Spring Cleaning Sheet is a great tool for anyone looking to clean their home and finally keep it clean. Everyone loves a clean space; it gives you a positive feeling that promotes productivity. However, you don’t really want to take the time to clean each and every day, no one does. This simple template allows you to easily go from a hot mess to absolute success. Finally, get organize your cleaning list this year by downloading the free Cleaning Sheet template. You’ll need to start by downloading the file containing the document directly to your computer. To do this, you will simply follow the link at the bottom of your screen. The headers highlighted in blue will tell you exactly what areas to clean so take the time to go through these and list the areas in your home you want to be cleaned. If you want to change any of the pre-written items, simply highlight the text and write something new. You will also notice that below each header is a list of items associated with that category. You will also go through these lists and enter items that suit the categories you have just changed. You can choose to either write your checkmarks after you print the document or you can keep everything digital by leaving the template on your computer and filling it out electronically. As you make your way through the list simply enter a checkmark in the box next to your completed task. When you finish all your tasks simply create a new sheet next time you need to do a comprehensive cleaning. Make the spring cleaning season work for you by downloading the template today.